The graphic is studded with awesome retro logos of airlines from bygone eras, like the aforementioned Braniff and Mohawk Airlines (“The Route of the Air Chiefs” — classy!). 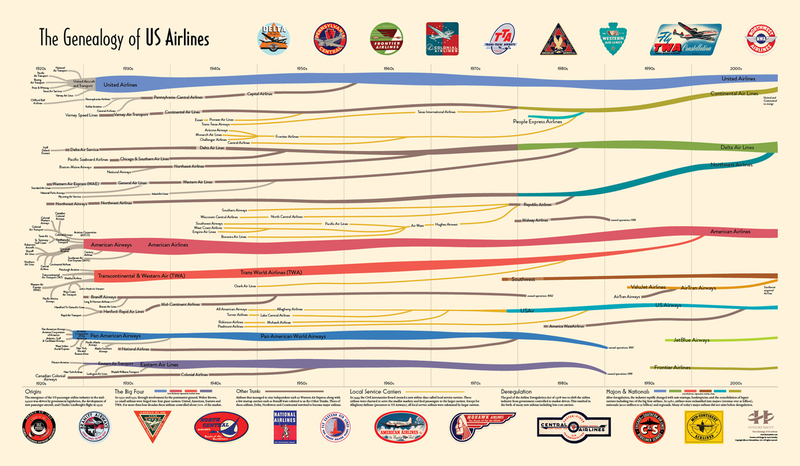 But the timeline itself is the most fascinating part, showing how a motley bunch of tiny air operators in the 1920s clustered together like The Blob almost overnight in 1930 and 1931, giving rise to The Big Four: United, American, TWA, and Eastern Air Lines. (Pan Am actually consolidated a few years before.) The thickness of the lines corresponds to “the relative market share of passenger traffic for each airline,” according to the poster retailer. It’s also interesting to see the impact of airline deregulation in 1978 visually, as smaller operators like Southwest and America West suddenly spring up and former behemoths like Pan Am dwindle. It’s cold comfort if you’re stuck on a JetBlue flight without that extra leg room option, but maybe tossing out a few of these factoids to your seatmate will help you pass the time before landing.